This ancient tomb is called "Yao Dolmen" (or "Kawachi dolmen") in nationally famous Takayasu tombs of Yao City in Osaka, Japan. This ancient's stone chamber has been completely exposed after embankment of the mound was lost. Place : Near the road which is called Noumendou in Kodachi, Yao city, Osaka. Access : 30-minute walk from Hattorigawa station of Kintetsu Line. Double chamber ancient tomb in Yao city, Osaka, Japan. structural type, which was constructed in late 6th century. Kinai region increasingly adopted the horizontal stone chamber structural style. The construction of this horizontal stone chamber is Migikatasode-style (a stone chamber with passageconnected the right side in the wall of the burial chamber) and opened to the south. As two burial chambers are connected together inside ancient tomb, it is very rare nationally. When looking at the rock chamber from above, if the passage is located at the center of the burial chamber, it is called Ryosode-shiki and if the passage is located toward right side or left side, itis called Katasode-shiki. 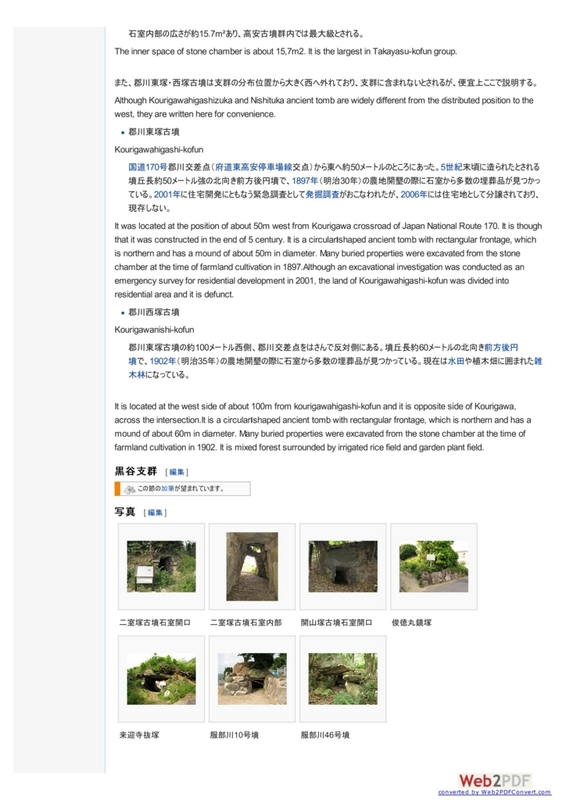 For this ancienttomb, “Nishitsuzuka-kofun”, William Gowland who is called " the "Father of Japanese Archaeology", did photographing by way of photomask with Romyn Hitchcock (1851-1923cultural anthropologist) and introduced it promptly to foreign countries. William Gowland (16 December 1842 – 9 June 1922) was an Englishmining engineer most famous forhis archaeological work at Stonehenge and in Japan. 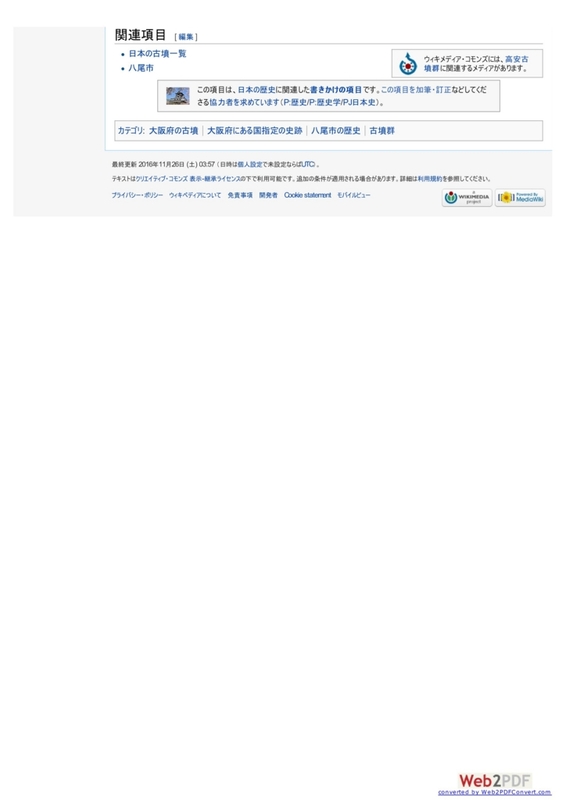 He has been called the "Father of JapaneseArchaeology". Access : 18-minute walk form the Hattorigawa station of Kintetsu Line. 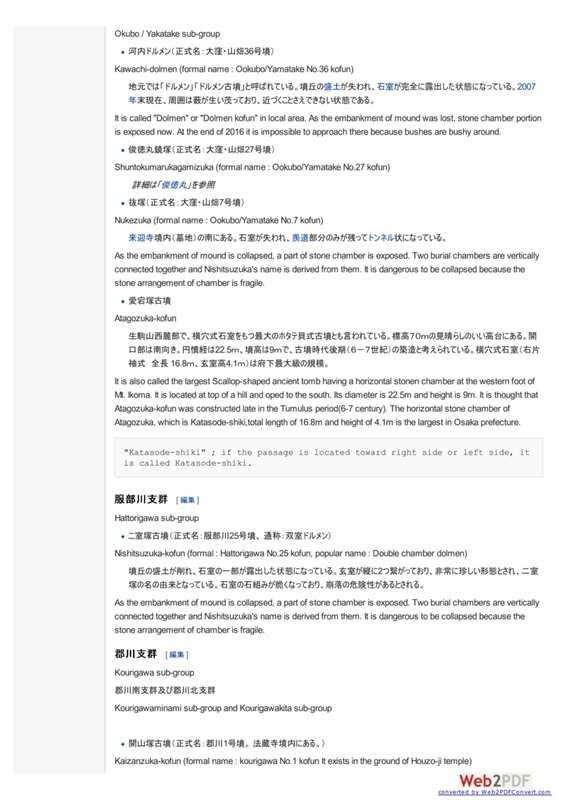 called "Nukezuka" because its shape is like a tunnel that people can go through. The remaining part is a passage of stone chamber, which is called, "sendo". Access : 20-minute walk form Hattorigawa station of Kintetsu Line. Atagozuka ancient tomb is designated important cultural property by Osaka. It is a round burial mound and has　dimensions of diameter, 25m and height, 6m. be the largest scallop-shaped tomb at the western foot of Mt.Ikoma. Access : 20-minute walk from Hattorigawa station of Kintetsu Line. Shuntokumarukagamizuka ancient tomb is horizontal stone chamber type whcih is constructed in sixth century. As it is said that Shuntokumaru who is famous for Joruri owned the ground, Shuntokumarukagamizuka has been regarded as his tomb. From this story, there are many stoneworks that kabuki actors, who succeeded between Meiji and Showa period,contoributed to this ancient tomb. The stonewaorks are a stand for burning incense, a waterbasin and a stone lantern. Access : 8-minute walk from Hattorigawa station of Kintetsu Line. This ancient tomb is called "Kaizanzuka-kofun". The total lenghth of this stone chamber is 13m. It is the largest a horizontal stone chamber with ryosode-style (a horizontal stone chamber with the passage connected the center of the wall of burial chamber) in Takayasu ancient tomb groupe. Edward Sylvester Morse (natural historian) who found Omori-zuka did precise survey of this ancient tomb and Immediately introduced it to European and American academia. 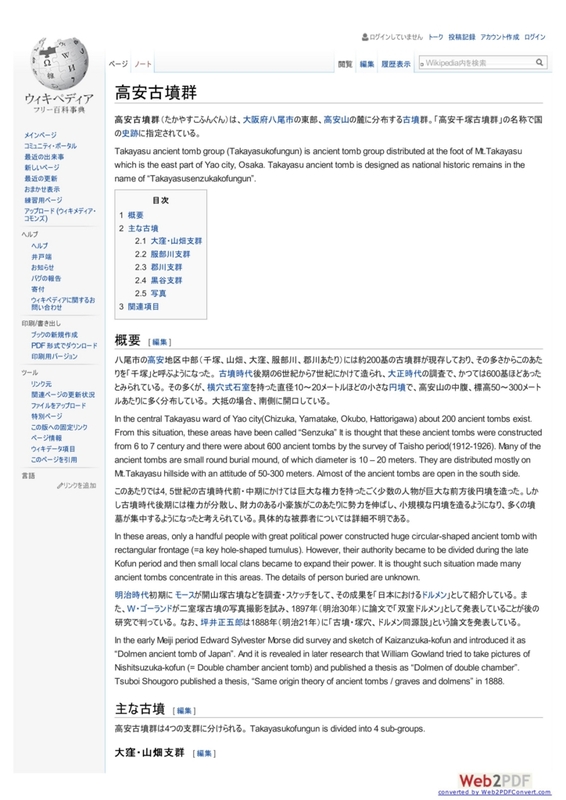 Kaizanzuka-kofun played the most important role in academic history of archeology. A monument called "Seiryotou" stands back of Kaizanzuka-kofun. Edward Sylvester Morse was born in Portland, Maine as the son of a Congregationalist deacon who held strict Calvinist beliefs. His mother, who did not share her husband's religious beliefs, encouraged her son's interest in the sciences. An unruly student, Morse was expelled from every school he attended in his youth — the Portland village school, the academy at Conway, New Hampshire, in 1851, and Bridgton Academy in 1854 (for carving on desks). He also attended Gould Academy in Bethel, Maine. At Gould Academy, Morse came under the influence of Dr. Nathaniel True who encouraged Morse to pursue his interest in the study of nature. Address : 3,6-chome, Kourikawa, Yao city. Access : 20-minute walk form Shigisankuchi station. “Double chamber ancient tomb” in Yao city, Osaka, Japan. This ancient tomb ,“Nishitsuzuka-kofun” is located in Hattorigawa area of approximately 300 tombs of Takayasu-kofun in Yao city, Osaka, Japan. It is horizontal stone chamber structural type, which was constructed in late 6th century.In the late half of the fifth century, Kofun mounds in the northern part of Kyushu and the Kinai region increasingly adopted the horizontal stone chamber structural style.The construction of this horizontal stone chamber is Migikatasode-style (a stone chamber with passage connected the right side in the wall of the burial chamber) and opened to the south. As two burial chambers are connected together inside ancient tomb, it is very rare nationally. Ookubo/Yamatake No.7 ancient tomb : This horizontal stone chamber ancient tomb is located in the south place of graveyard of Raiko-ji (temple) . It is also called "Nukizuka" because the style is like a tunnel that people can go through. The part that still remains is a passage part of stone chamber.